Is journaling a part of your recovery toolbox? If not, please consider picking up the pen or laptop and jotting down some of your thoughts; those who do so have an opportunity to strengthen their program. People new to recovery have a lot to learn about navigating through life without drugs and alcohol, and years of substance use can muddy the waters of the mind. While it takes some time for the fog of active use to lift organically, there are ways to help the process along. One of the primary facets of addiction recovery is processing your thoughts and coping with feelings in ways that do not involve drinking and drugging. Going to meetings and developing a support network is exceptionally beneficial for sifting through the chaos of one’s past and adopting methods for achieving long-term sobriety, but there is more work that can be done behind the scenes. Those who pray and meditate can avoid many of the pitfalls of early recovery. Grounding yourself and calming your mind helps you gain perspective about all-things-life. Writing down your thoughts is another excellent way to center yourself and find clarity amidst the noise of the inside. People who’ve been in the program for a while, utilize writing down their thoughts for myriad reasons. Sometimes they write out a gratitude list to remind themselves of all that they are grateful for today. Other times unloading one’s conscience on paper is a means of letting go of something that is bothersome. Whatever be the reasons that people in recovery write for, the act of doing so is almost always cathartic. People in the infant stages of healing from the psychological and physical injuries of addiction may be reticent to let out their feelings on paper. Seeing you write may make an issue seem more real or stir up even more painful feelings they’d instead not remember. Others might talk themselves out of journaling because they don't feel like they are good at writing. Please remember, there is no standard to journaling; the goal is to release some of the stuff inside rather than use a substance to keep it buried deep. In recovery, we do not ignore or run from our feelings. Today, we no longer delude ourselves into thinking that the answers to our problems can be found in a bottle or syringe. Instead, people in recovery are committed to looking inward even if there is a chance they will not like what they see. Such people remind him or herself that their past no longer defines who they are as a person. Bravely, they face their dilemmas honestly. 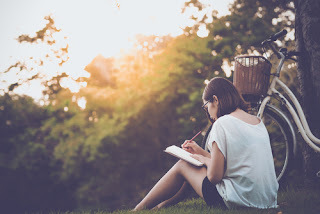 Getting a feel for journaling may take some time, you may have to practice at it; to start, maybe you can find a half-hour each day to put your thoughts on paper. In no time at all, you may start looking forward to writing for recovery. It’s possible that writing exercises may not be for you, and that's ok; there are plenty of ways to make sense of your existence that do not involve pen and paper. Hopefully, writing becomes an informative experience for you, one that helps you stay on track in recovery. Please contact Hope By The Sea to learn how we can help you make recovery a part of life. We offer medically supervised detoxification, residential and outpatient rehab, extended care and sober living.